This case-based, interactive lesson teaches a process for forecasting clear air turbulence (CAT) and applies it to a case that occurred over the U.S. Information about the synoptic patterns that generate CAT and the products and indices used to identify it are woven into the case. Some of this information is presented in optional sections intended for those who are unfamiliar with the material or want a refresher. 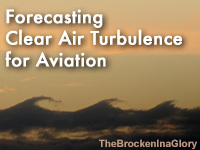 The lesson is aimed at national and international forecasters who make aviation forecasts. Good Materials with up-to-date science and focus on practical aspect of turbulence forecasting in the ops bench. Many thanks for broadening my understanding in CAT. But I must say that some of the terms used here were bit confusing to understand. For example, turbulent waves? Turbulence forms as a result of breaking of waves. So isn't it a contradictory term? Also, one quiz question appeared to be particularly absurd to me. It reads: "What altitude has the lowest potential for turbulence?". As a forecaster in the ops bench, don't we just focus on the 'highest potential' for turbulence? When the forecast of turbulence is still largely 'subjective', can we really be confident on the 'lowest potential' when we often scratch our head to identify the region of the 'highest potential'? This lesson was very good,complete and useful for understanding what is Clear Air Turbulence and forecasting its for Aviation. After failing the quiz it showed me my so-called "answers" and the points I received from them; however, all that showed up was the questions with none of my answers checked nor the possible points I earned per answer. Then out of curiosity I decided to pass through the quiz w/o answering a single question and at the end I still end up with 12 points on the board. I do not understand that at all. Hi! I would just like to point out there seems to be some discrepancies in the quizzes for this and other lessons I have taken. There are times when I know for a fact I have answered the question right (looking back at the slides and comparing info in the slides to the quiz question) and it still marks me wrong. In this lesson in particular, question number 9. "what is NOT important to inform other forecasters when moderate or severe CAT is likely?" All of the answers but one seemed to be info that should be shared. I even looked back at the correlating slide and the one answer was NOT on the slide indicating what should be shared with other forecasters. I picked this answer and I am marked wrong. There are other discrepancies that have been noticed in many lesson quizzes that I think in all fairness should be checked and reviewed. Pretty good, but could use more details visually and in explaining the processes. The graphic with wv and PIREPS was hard to see. it was a breath taking lesson that need one to understand well. Overall it is a very good course. I think some audio and video would assist in making this lesson more engaging. From a textbook side of things, it was ok though. Really good module. Enjoyed it but takes more than 30-45min to do like previous reviewers said. The module says the type of aircraft that will be affected is an important info to relay but I think that's wrong. CAT is quite subjective to the pilot and the type of aircraft, so experience might report light cat as some might report the same as moderate. A small plane might report CAT as severe as big one might not report any. It's important to relay the type of aircraft that WAS affected. PIREPS symbols are not explained. For someone with no prior experience, it's hard to understand what is MDT,SEV,etc.) Quiz has a typo in the correct answer for the altitude of CAT... hard to get it right. Overall very good; you need to define your PIREP symbols on the plots (what does "CP" mean) as well as increase the resolution of the plots (could barely differentiate between severe and moderate PIREP). These issues impact quiz questions also. The CAT terminology (originated decades ago in the aviation world) is really a misnomer....often, as you admit, this turbulence is in-cloud....what purpose does it serve to confuse the novice? Noticed a typo on one of the imbedded questions: "aerial" should be "areal". Your TKE units are kts in the text, while on the plots it is correctly in J/s. We get numerous moderate pireps here above the tropopause, which contradicts your claim that the stability can suppress the turbulence here. In the questions which involve loops, the questions themselves generally apply to the early portion of the loop, which if unstated can lead to confusion. Also...several imbedded questions are missing the "choose all that apply" instruction. The effect of turbulence on various A/C types is not covered in this module and should be removed from any question. it is a very good and useful lesson for me. since i have wrote a paper about clear air turbulence, i have a great interest about turbulence forecast. Nice course, I increased my quiz score from 63 (before) to 71 (after). Took me significantly longer than 45 minutes, though... once you read the "in-depth" material (which is what you want to get an idea why things are what they are) you can calculate 2-3 hours.